The Varnished Culture attended a book launch and signing in April 2017 and made two important discoveries. First, we rather like Albert Park, once an inner Melbourne ‘burb of faded grandeur, now a plush and trendy nook that is about to out-Toorak Toorak. 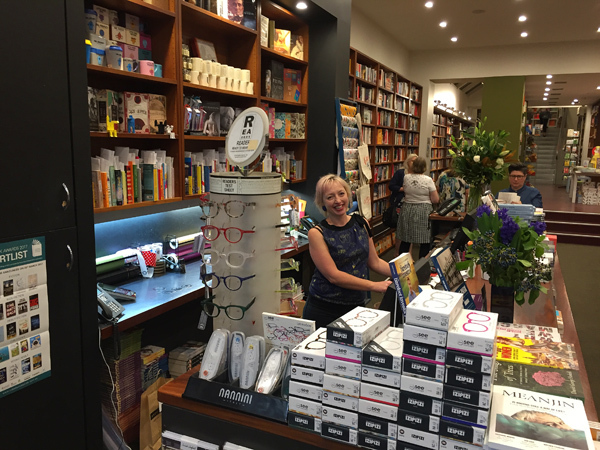 And the Avenue Bookshop matches that vision – new books, great selection. They’ve sister stores in Elsternwick and Richmond but we’ll stick to Albert Park, thank you. Hill of Content, Hill of Content, Hill of Content. Perched on a real hill, hiding behind the trams and general horror of Burke Street traffic. It always makes TVC smile when we see that stark black and white sign (‘love that font!’). Go there. The Paperback Shop. Just yards from the Hill of Content (did I mention the Hill of Content?). Teensy weensy and somehow with a stock all of its own. There is always something different on the shelves which no other shop seems to have. Go there too. Embiggen. A most attractive newcomer. How I covet the wall of ornately spined special edition hardbacks and the bookcase door. Although the name would make Lisa Simpson scream and the shop does have a decided lefty lean, it is another place you should go to. Readings is a chain, but go to the one at the State Library – TVC slide in, disguised as mature age students, and take unfair advantage of the very eclectic bargain bins. Also a good selection of higher left-wing trash, some excellent reading. Country Victoria is a nice place to find second hand bookshops of charm and quality. Though a recent trip to Clunes had us coming up short, the Paradise Bookshop in Vincent Street, the main drag of Daylesford, belies its name and features a large and varied selection of quality books of a secular nature.